Founding of the factory is based on 1920's. The founder of the factory Arapzade Ahmet Efendi, has bought the factory building and the factory land government at those years. The first view of the factory was a mill.The water which overcomes from Derinöz stream that is one sleeve of the Tersakan River has split on five (BEŞ) compartment (GÖZ) and flour was making through the movement of five stones. 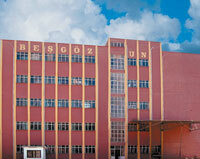 In this way the name of our factory has become BEŞGÖZ. In those conditions the producing activity goes on 20 years. In 1940's to conform to comply with change and development of technology various machines have bought for factory and so the quality and capacity of flour increased. In 1960's our factory has modernized again. At the end of the modernization new factory supplies have bought from Russia and daily producing capacity and the quality have become the best level for that year's conditions. In the while,because of the flour necessity and the flour factories minority, required flour was preventing from our factory and a few other flour factories. In 1980's our factory get new factories opening started and give movement to the flour industry. Our factory is modernized with its own capital in 1985 and from that time it goes on producing in new building and equipment. Today our factory is landing 12.000 m2 area and have 1000m2 closed area. In the closed area there are factory building of five stories, flour warehouses, wheatsilos, an administration building, a guesthouse and a dining hall. The production capacity of our factory is 210 ton/day. the equipment of our whole units are suited the latest technology.